Yesterday we got the big wave 4 (green rally and then drifted down to this morning’s 9am finish of the diagonal I posted about yesterday. That 5th wave I wasn’t expecting to be so short but it technically dipped right below 2050 as I expected — though just by one tick and reversed huge. The completion of the diagonal I noted yesterday would mark completion of 1, followed by a-b-c wave 2. But since it went straight up– there was no a-b-c subdivision- and it hit just below the prior green 2. Momentum to the downside was strong and once it broke this mornings 2049.75 low– we knew that the wave 2 was complete and this is the beginning of wave 3 down. So far pattern is playing out according to our expectation. All those what said last week’s rally on Friday (green 2) was an indication that we would break highs were wrong. Instead, we spotted that as a clear wave 2 and Monday’s wave 3 (green) color firmed that for us. Our position is up $2,400 and hey with this pattern we even began next week’s trade today– a little early — but we have confidence with this pattern. 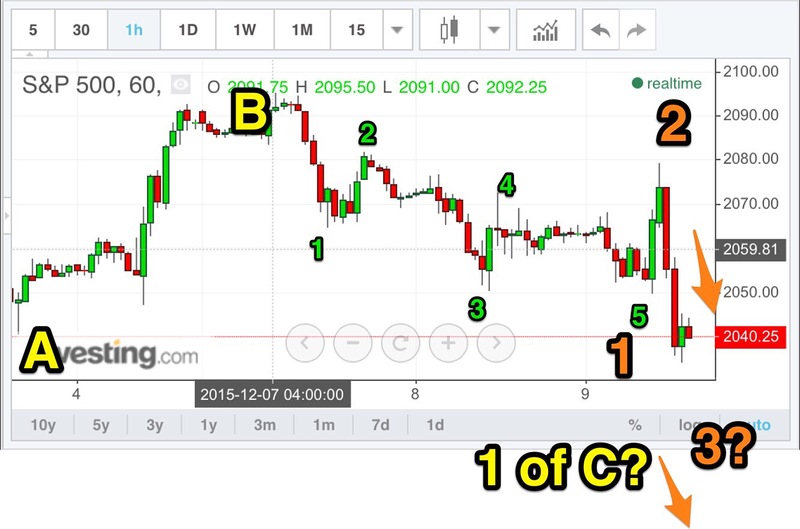 Subscribers got our trade alert and video of how to put it through right on your phone. Congrats to all others who followed and are banking $2,400! Previous post Tuesday, December 8, 2015: continued profits, here’s my forecast for tomorrow Next post Thursday, December 10, 2015: 2067 high holding below 2080 resistance; Did wave 3 just begin?